Comic-Con 2012!! Set Your Recording Devices!!! ‘Walking Dead’ Season 3 Premieres October 14th!!! The ‘Walking Dead’ panel couldn’t discuss much for their upcoming season on AMC, but they did however give us a release date for the season 3 opener. Series creator Robert Kirkman told everyone that season 3 will premiere on October 14th on AMC and said, “We open on a scene of I can’t tell you. Robert Kirkman and fellow producers Gale Anne Hurd and Mazzara, along with David Morrissey, Andrew Lincoln, Sarah Wayne Callies, Stephen Yeun, Norman Reedus, Laurie Holden, and Daniai Gurira were all in attendance. Morrissey will play the Governor as Gurira will be playing Michonne. Morrissey is a huge fanboy and won the crowd over with his geek-ness. It’s going to be great. Count them days down till the zombie apocalypse. ‘The Walking Dead’ Gives Comic-Con Fans Season 5 Preview!!! 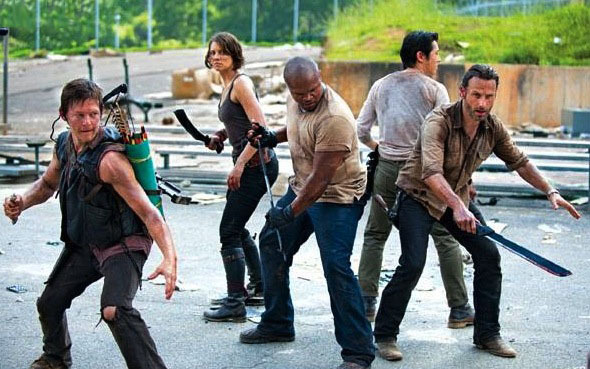 ‘The Walking Dead’ Companion Series Headed To AMC!!! ‘Fear The Walking Dead’ Trailer Debuted At SDCC!!!!! This entry was posted on Friday, July 13th, 2012 at 4:41 pm	and is filed under Comics, Events, News, Television. You can follow any responses to this entry through the RSS 2.0 feed. You can skip to the end and leave a response. Pinging is currently not allowed. « Comic-Con 2012!! Get a Seek Peak at ‘Dexter’ Season 7!!! I bugged the scotch bottle.